Mirah Belle's natural skin brightening soap recipes have been developed to produce a mild, skin-nourishing effect that not only heals the skin but also leaves it feeling clean, smooth and fragrant. Mirah Belle brings to you cold processed skin brightening soaps that retains natural glycerin. Individual skin care needs are unique, so we offer a variety of formulations for all age groups and skin conditions. Pure Essential oils are added to each variety depending on the skin type and condition. Correct your skin tone with the Goat Milk, Grapefruit Cleansing Soap Are you tired of greasy, oil, pigmented skin? Now help your skin feel rejuvenated with the Goat Milk, Grapefruit Cleansing Soap. Meant for oily and pigmented skin, the soap works wonders to cleanse your skin, fight off infections, unclog skin pores and corrects your skin tone! 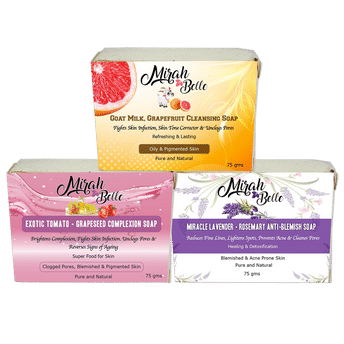 Believe in miracles and heal your skin with Miracle Lavender Rosemary Anti-blemish Soap Blemishes, dark circles, and dark spots are some of the things that ruin the beauty to a large extent. You must have tried a number of products available in the market for getting rid of these dark spots. But you must keep in mind that these products are filled with synthetic and artificial chemicals which might help you to get rid of these dark spots, but in the long run, they are only going to harm your skin. The All-in-one Complexion Soap You Need in your Beauty Routine Today! One of the biggest mistakes that you are probably making in your daily beauty routine is the process of cleansing your skin. If your skin isn't clear of all the dust and grime that accumulates during the day, you are bound to suffer from problems like visible pores, blackheads, pimples, dark spots and uneven complexion.